Welcome to this week's episode of Social Chatter where we cover the latest social media news from this past week. Each episode of Social Chatter is available as a blog post or video. We're also joined by this week's special guest, Owen Hemsath. In LinkedIn news, they are launching matched audiences. LinkedIn matched audiences are "a set of targeting capabilities that gives you the unique ability to combine LinkedIn's powerful professional data with your own first-party data." According to LinkedIn, "Matched Audiences helps you engage key accounts, prospects, and audiences that matter most to your business with three new capabilities: Website Retargeting, Account Targeting, and Contact Targeting." If you're a Facebook user, LinkedIn matched audiences are significantly better than Facebook custom audiences. This is because you're able to target people you are connected with through work as well as your personal life, whereas, on Facebook, you could try targeting people who were B2B customers; however, most of that audience didn't use their work email address. With LinkedIn matched audiences, that changes, a lot. In fact, here are some strategies you can implement, which should help LinkedIn advertisers get their message in front of the right audience. So far, we're really excited about the potential of LinkedIn matched audiences. According to LinkedIn, "Matched Audiences is available for all LinkedIn advertising products, including LinkedIn Sponsored Content, LinkedIn Sponsored InMail, and other ad formats." This also means you'll have the ability to do website retargeting, account targeting, contact targeting, and much more to help you deliver high ROI and lowered costs. Here is a short video showing you all of these new features for matched audiences. You can read LinkedIn's announcement about matched audiences here. In Instagram news, they have reached 700 million users. While Facebook still dwarfs Instagram's audience size, 700 million users isn't anything to laugh at. One thing that is impressive is the fact that some 100 million users were added on Instagram faster than at any other point. With new features like Stories, Live Video, disappearing messages in Instagram Direct and more, Instagram is clearly on an upwards trajectory. Now add in the fact that you can't yet include links in posts, set up an ecommerce store on Instagram (unless you use third-party tools) and Instagram is in for tremendous growth in the future. As a business, on way that you can prepare is to setup an Instagram business profile. This way you can begin familiarizing yourself with the dizzying array of features. Next, we would begin to build a community of followers and engage with other accounts. By the time Instagram reaches 800 million users or even 1 billion Instagram users, you'll be ready to capitalize on the platform for your business. To read more about Instagram reaching 700 million users, take a look at this article. In Facebook news, they are testing video cover photos for Facebook Pages. With Facebook making the push to live video, it doesn't surprise us that cover photos might get the same treatment. The Netflix series, Narcos, recently started showing videos in their Facebook Page cover photo area. We could see this being extremely useful for businesses of all types. On YouTube, you have the ability to upload a video to introduce yourself to your audience. Why should your Facebook Page be any different? Imagine being able to create a short video teaser or sizzle reel about your business to engage new and current fans? Right now, this is the only Facebook Page that we have come across, but it is coming. Do you know of any others with Facebook Page video cover photos? If so, please tell us about them in the comments. Also in Facebook news, they are testing different placements in the news feed for related articles. In 2013, Facebook launched related articles. Their goal was to "help people discover new articles they may find interesting about the same topic." Related articles would appear after people read an article. In a move done to "support an informed community," Facebook is testing adding related articles before you read an article that was shared in News Feed. Facebook plans to learn from these tests to improve the experience on Facebook. Right now, which way do you lean? Would you rather see related articles before you read content or afterward? There are benefits and drawbacks to each. Which way would you prefer? In the meantime, you can read the announcement from Facebook about news feed related articles here. In Twitter news, they want 24/7 live video streaming. Twitter recently lost the rights to stream NFL games to Amazon. They are still planning on pursuing live video though. In a move to continue to grow their user base, their COO and CFO, Anthony Noto, said, "We will definitely have 24/7 video content on Twitter. Our goal is to be a dependable place so that when you want to see what's happening, you think of going to Twitter." While they didn't go into specifics, they do plan to cover sports, news, as well as entertainment. With more and more of the population tuning in to live video, this move makes a lot of sense for Twitter. If you are a business owner, the way you can get up-to-speed with live video is to begin using it. If you're already invested in Facebook Live video, we suggest repurposing some of the tools you likely already own, as you make your way into creating more live video content. You can read more about Twitter's plan for 24/7 live video here. In addition to sharing the latest in social media news from this past week, we also highlighted some great tools and apps to check out. The first tool we have for you this week is called Stormcrow (iOS). Have you ever needed to tweet more than 140 characters at a time? Rather than try and break-up your tweets and add the appropriate denotations of (1/4), (2/4), (3/4), etc, Stormcrow can help you with that. With Stormcrow, you simply type out your tweets and it will break them at the appropriate places and add the number to denote how many tweets a Twitter user can expect to see. Overall, we see this saving us a lot of time because it handles everything for us. All we have to do is focus on writing good, quality tweets. You can download Stormcrow from the link below. The next tool we wanted to share with you is called Ecamm Live (web). We're extremely excited about Ecamm Live. The reason is because you can use Ecamm Live to broadcast Facebook Live videos from your computer with ease. Here are some things we really like about Ecamm Live. Here is a short video showing you some of the amazing things you can do with Ecamm Live. One other thing that really impressed us about Ecamm Live and should impress you too is the price. We currently use Wirecast; however, that can cost upwards of $800. Ecamm Live is available for around $30 and is well worth the purchase price because of how easy it is to use. While they don't currently offer a feature to let you have multiple people on during your broadcast, they are working on it. You can purchase Ecamm Live from the link below. 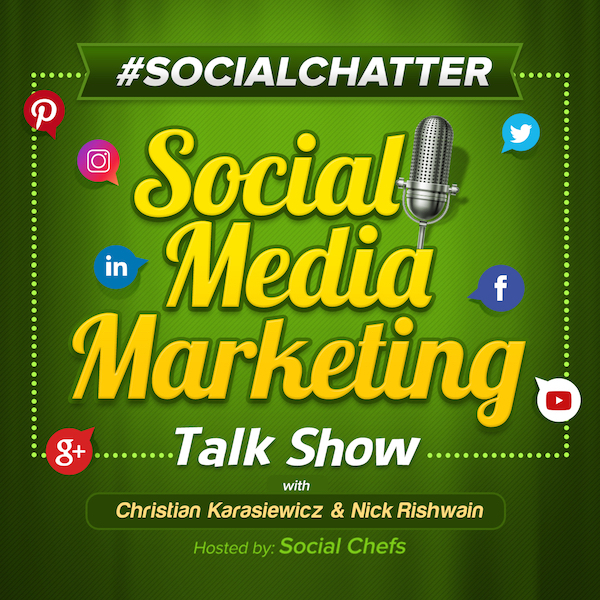 To watch next week's s of Social Chatter, your weekly social media marketing talk show, tune-in to our Facebook Page to find out what's new in social media news!